Apparently I’m on a quick bread kick here lately. Or maybe I just had 3 bananas sending me accusing looks from their (rapidly decaying) vantage point on my counter. Who’s to say? 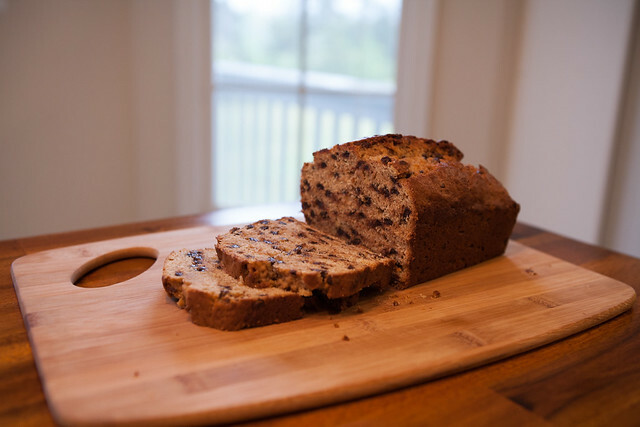 Either way, I’ve had it from a very picky Banana Bread connoisseur (ahem. My husband) that this bread is perfect just the way it is and I should no longer mess with the recipe. The base recipe is from How to Cook Everything, Mark Bittman’s epic cookbook, and I only played with it a very little bit to suit my taste. Actually, that’s not true. Those chocolate chips ended up in there because I had half a bag of them hanging out in my pantry and this seemed as good a fate for them as any, so really, what happened is that I just dumped some extra odds and ends in to facilitate my house cleaning. You can omit them if you really want to, but I’ll send you an accusing look if you do. Because bananas and chocolate chips go together like peanut butter and jelly; like Ross and Rachel. I also added a bit of coffee emulsion because I have it from a good source that bananas and coffee should also be on that list of meant-to-be-togethers. Although I think you could use a bit of strong coffee or espresso if you don’t have coffee emulsion/extract. Also, I would tell you that even if some people who fancy themselves Banana Bread Connoisseurs (ahem. See above.) somehow find out that you used a teensy tiny bit of whole wheat flour and send you their own accusing looks, you should ignore them and do it anyway. You can’t even tell it’s in there (cue disgusted snort from said connoisseur) and it gives it a little more substance, a little more chew. 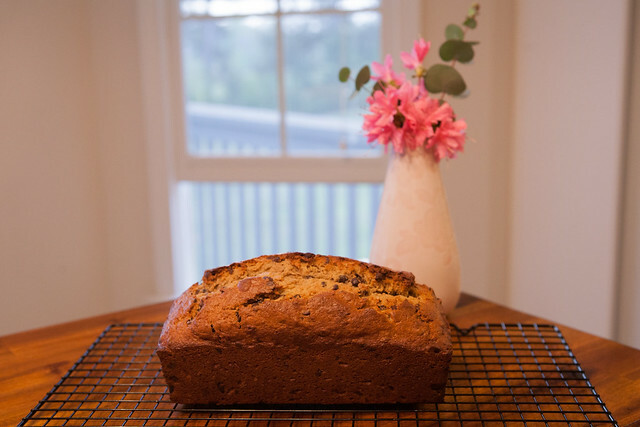 It’s still perfectly moist and light, with a very tender crumb, and I’d like to remind…someone…that they did say it was the best Banana Bread I’d ever made. So there. Preheat overn to 350 F and grease a 9×5″ loaf pan. With a hand mixer, or a sturdy spoon or silicon spatula, cream the butter in a large bowl. In a separate bowl mix together the dry ingredients. (You don’t really need a mixer here as long as your butter is fairly soft. I just sort of mash it around a little then add the eggs, etc). Beat the eggs and bananas into the butter, then add the dry ingredients. Finally, stir in the vanilla, coffee substance of choice, chocolate chips and the nuts if you’re using them. Don’t worry about making the batter smooth – it’s supposed to be lumpy, so just mix it up until all of the flour has been incorporated. Pour the batter into the prepared pan and bake for approximately 1 hour, until a tester comes out clean, or with a only a tiny crumb or two. This bread is pretty moist, so I generally pull it out when a well formed crumb sticks to my tester (not batter, mind you, actual crumbs), since I know it will keep baking for another moment or two until it cools. Do it! Do it! A little healthy competition never hurt anyone!